Yep, that was me. On the way back from skating Monday night, we went to McDonald's for an ice cream. Well, we don't go to fast food restaurants, so when the boys got there...they wanted food. (I know, I use the term loosely there) We are of the opinion that you don't deprive or keep our kids from trying things. That being said, we allow them to make their own decisions, within reason, when it comes to food. We rarely go out to eat and when we do it is some place like Moe's (burritos) where there are healthy options and we can all eat within our food restrictions. I cook almost everything from scratch and everything is made in a healthy way. (I can't help it, it is the way I was made...you are what you eat.) Anyway, the boys got some sandwiches and fries. As soon as they got in the car, there were complaints of belly aches. Jay, the 11 year old, was asking about how bad that sandwich was for him. Max, the 9 year old, was in pain and swearing off fast food for the rest of his life. Now, I know that won't last forever, but this all led to a deep discussion of food, where it comes from and what makes it bad for you. Remember, I am the fly on the wall. I was not involved in this discussion. The illustrator was the one talking about all of the nutritional information in the different foods the boys were asking about. I was so proud of the 3 of them. All this time, I thought I was talking to hear myself talk. They do listen! We have all been watching Jamie's Food Revolution together and when he made the chicken nuggets a couple of weeks ago...Max chose not to eat the nuggets at school the next week. He reminded me of that episode and told me that he did not want them. He ate the salad! Mind you, he eats salad at school all the time. That boy is definitely mine! He and I can sit down and eat an entire cantaloup in one sitting together. There is all of this discussion about children being overweight due to food choices. I can tell you that part of this is genetics, but part of it is introducing your kids to the right foods. I did not always like cantaloup, but tastes change, so you should continue to try things over and over. It takes time to develop a taste for anything. Liking some foods becomes a habit. That goes for the good or the bad. Good food does not take any more time to make than bad food. There are tricks of the trade too. You have to also be willing to change your idea of what things should taste like. I can say this from experience on a lot of things. Seriously, people...I can't eat cheese. Trust me, there is no "perfect" substitution for cheese! The illustrator had to say good bye to wheat bread, but we have learned that there are alternatives that are good. The same goes for being healthy in your food choices. I eat a lot of "weird"stuff, but it makes me feel great! My boys are learning from us and it makes me happy to know they are concerned about what they are being fed. Like I said, I won't deprive them. They had Twinkies for the first time last summer. (I know, shocking. I don't even remember eating Twinkies when I was a kid. To this day, I don't remember ever eating one.) They liked them. Then, I made some from scratch...they devoured them and asked for more. I think it is important for them to know they can have whatever they want, so they don't sneak things later on. That just creates a whole cycle of bad eating habits. I am a firm believer in everything in moderation. You only live once right? I don't know if I got anywhere on this. I totally just got on my high horse...sorry. I am just so proud of my kids. There are plenty of healthy things they won't eat, but the fact that they are questioning what's good and what's bad lets me know they are interested in their health. That makes me so happy! Combine these and mix well. Preheat your oven to 350 degrees. Spray a 10 inch round dish or a 9 x 11 baking dish. 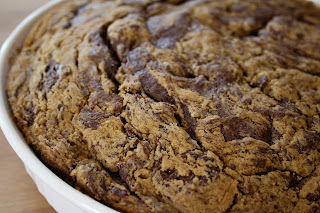 Spread the brownie batter in the pan and then pour the graham mixture on top. Take a knife and swirl the graham mixture into the brownie mixture. Bake for 30-35 minutes or until a toothpick comes out clean. After it cooled, I put large marshmallows cut in half on individual servings and broiled them for a couple of minutes until nice a toasty. Just so everyone knows...I am not perfect. I do have my vices. I just had to get it off my chest. So...that being said...what are your favorite junk foods? I do love me some s'mores! I love your approach to food choices & your kids :D I definitely think that "banning" foods from kids doesn't work and if anthing...it makes it more desirable. I also think that leading by example has a huge impact! um yummmmm. i love anything to do with smores!! OMG, those S'mores brownies turned out amazing. Great job! the smores brownies...you vegan'ed and GF'ed em. NICE! I have not bought the kinnick crumbs but have seen them and thought bout it! Like Danielle said "banning" foods (behaviors, places, people, clothing...) from kids just makes the item more appealing. Adults are the same way! :) it is the balance we should try to strive for in all aspects of life. Balance is why I started my blog and it has really helped me to see some of my behaviors in black and white. I think it is fabulous how you are raising them to think about what they eat! mmm, I do love s'mores too. I have a hard time turning down a good chewy cookie - probably my biggest weakness. Shortbread or crunchy cookies, not so much. Sarena, I was so happy to read this post. You have such a balanced and healthy approach to food and eating. I love love love that you are incorporating your beliefs in all aspects of your life and teaching your children about nutrition and moderation. As someone who grew up morbidly obese and ate lots and lots of fast food and twinkies, I do believe that so many people simply lack knowledge of proper eating and what constitutes a healthy lifestyle. This is such a crucial area that needs more light shed on it, and Jamie Oliver's show is a huge help. I adore you and your values. And the S'Mores!! What a talented baker and chef you are! You're an inspiration! We dont eat out a lot but I can't help it, I love a plain ol' macdonald's hamburger. you know, the one that come in the happy meal. I don't even need the fries. Eating well has to be a decision in this world because so much that is bad for you is everywhere... and then I am married to Tony who loves to cook with tons of butter and red meat...either of which I can do without really... but he cooks and that means I dont have to. ahhh what's a girl to do?! oh those brownies look amazing! 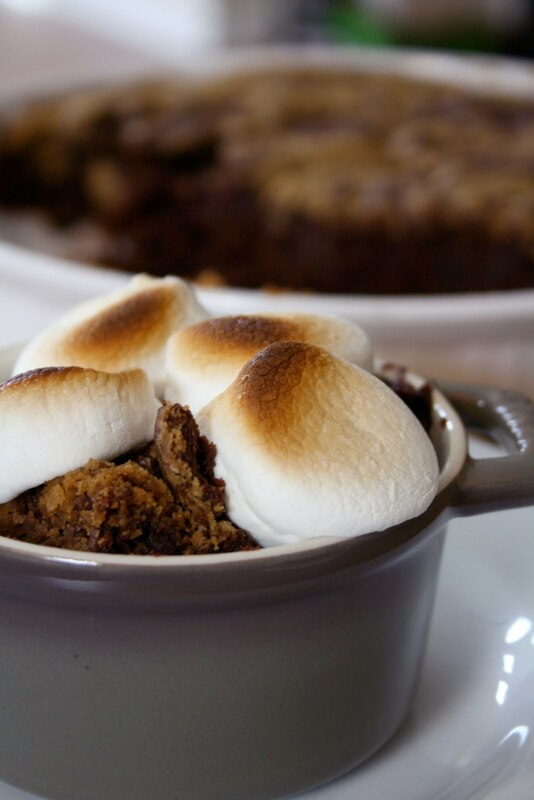 The smores brownies look really good and I love the ingredients.